But at Windsor, possibly through George FitzClarence, she made the acquaintance of another young officer. 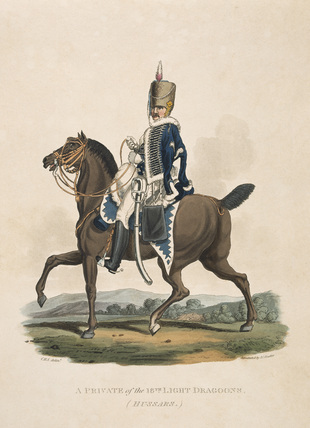 Lieutenant Charles Hesse of the 18th Light Dragoons was good-looking if a little short of statue, but he looked well on a horse, and had a confident air which she found attractive. 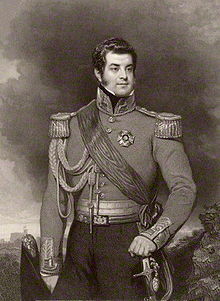 He was rumoured to be the Duke of York’s son by a German lady of rank, which doubtless added a certain piquancy to his charms, and Charlotte, driving in an open carriage with Hesse on horseback at her side, fell imperceptibly and delightfully in love. For six weeks, Lady de Clifford, sitting beside her royal charge, turned a blind eye on the proceedings; but suddenly and at last she found her position untenable. This sort of things could not be allowed: what on Earth would the Regent say? At all costs the affair must be stopped. Unfortunately by this time Lady de Clifford had ceased to have any influence whatsoever on the young princess, who did precisely what she chose. There was a genuine affection between them, and Charlotte, headstrong and impulsive, tried not to upset the old Dowager. But this time passion prevailed: Charlotte refused point blank to stop seeing Hesse, and when Lady de Clifford insisted upon the rides being given up, there was a violent quarrel. By this time, the Princess of Wales knew of the affair, and in her mischievious, irresponsible way, hurled herself into the battle. It was time, she decided, for Charlotte to have a romance, and without considering the consequences of such a situation to the Heiress Presumptive, set herself to encourage the lovers. Hesse had already been given little notes to pass from mother to daughter, and when, after the scene with Lady de Clifford, Charlotte arrived at Kensington in floods of tears, Caroline took charge of the situation. ‘This will play the Devil at Windsor, but I will make amends for it,’ she declared. She would receive their correspondence and pass it on; and the pair were to meet at Kensington Palace: she arranged to let Hesse into her own room by a door opening into the gardens. In her folly and half-crazy recklessness she flung open her bedroom, where she left her daughter and the young man together, and turned the key. What took place in this bizarre bower, scene of the Princess of Wales’s illicit pleasures, will never be known; but from Charlotte’s relation of the story to her father some two years later, it seems certain that love-making, if it took place at all, was of the most decorous nature. Hesse must have realized that his position was a tricky one. This was Lieutenant Charles Hesse of the 18th King’s Irish Hussars. His father was the Duke of York, and his mother, it was said, was an aristocratic German lady. He was not nearly as tall as George FitzClarence and, like many officers in Irish regiments in those days, he was a little bit of a rogue, but, like almost all of them, he was engagingly charming. And Charlotte adored him. There is no record of how Charlotte met her ‘little lieutenant’. She may have been introduced to him by George FitzClarence, or she may have met him through her mother. Like all sensible suitors, Charles Hesse paid court to Charlotte’s mother, to such an extent that she later told Mercer she was not sure whether he was her lover or her mother’s. The Princes of Wales used Charles to carry letters to her daughter, which of course was a good excuse to ride up to her carriage, and Charlotte used her mother as one of several couriers who carried her letters to Charles. For two or three months, between their meetings, she wrote to him recklessly and gave him presents, and she continued to write to him after he went down to Portsmouth to prepare for his regiment’s embarkation for Spain. Lady de Clifford was well aware that Charlotte and Charles were too fond of each other. She tried to prevent their meetings in the park, but as always she lost the argument. As a woman of the world – as a woman who had lived in the French court – she must also have been made suspicious by Charlotte’s long absences during some of their visits to Kensington Palace. But she may not have known for certain, as others did, that the Princess of Wales had let Lieutenant Hesse into the palace through the garden door. During those absences, he and Princess Charlotte were locked up together in her mother’s bedroom. Like the rest of the royal family, Charles’s father, the Duke of York, was at least aware of the inappropriate meetings in the park. But he did not feel inclined to reproach anyone. He was one of the many who disapproved of the way in which the Prince Regent prevented his daughter from appearing in public or even in society. If the Princess was lonely, she could hardly be criticised for taking pleasure in such company as she could find. Hesse was good-looking, attractive and a good horseman, and was soon received in society. However, his good fortune led to rumours about his parentage which Hesse did nothing to dispel. Lady Blessington says Hesse was presumed to be a son of the Margrave and Margravine of Ansbach from before their marriage, while Captain Gronow says that Hesse was generally believed to have been fathered by the Duke of York. Either way, Lady Blessington comments that “the calibre of his mind could not be better proved, than by his preferring to have it believed that he was the illegitimate child of persons of high rank, rather than the legitimate son of a respectable banker at Berlin”. When Hesse was posted with his regiment to Bognor, in his vanity he sought to attract the attention of Princess Charlotte of Wales, only daughter of the Prince Regent, who was staying there. Several letters were exchanged between the couple through Margaret Mercer Elphinstone (later Countess de Flahaut), though General Garth also delivered some letters under the impression they were from Charlotte’s mother the Princess of Wales, who was estranged from the Regent. When the romance was discovered Hesse was sent out to Spain with his regiment.